We just learned that The Universe Builders: Bernie and the Wizards won a Silver Medal in the Readers’ Favorite Book Contest. The book was entered in the Young Adult – Fantasy – Epic category. The Universe Builders: Bernie and The Wizards by Steve LeBel is the long anticipated sequel to Bernie and the Putty. This story picks up one week after Bernie’s first world wins the prestigious universe award. 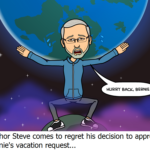 Armed with his ingenuity and problem solving skills, Bernie’s first assignment is to fix a veteran’s world by solving the problem of why the harvesting of the two designated crops that this world has created is at a standstill. After meeting with the world’s creator, Bernie decides to drop in amongst the population to gather some information, in the guise of Wedon, an old weary traveler to all but a shaman named Reva. She uses a spell that reveals his true form. Suspecting that Bernie is more than he appears, she hopes that he might offer to help and maybe even do some healing for her villagers. Mr. LeBel’s writing shifts between Bernie’s assignment and his friends, Lenny and Suzie, whom he meets during breaks from work. They also give support by way of advice and tidbits of knowledge that help Bernie to understand things in his assignment. LeBel’s characters have a certain quality about them that helps move this story along at a pace that forced this reader to turn each page with bated breath. When Bernie is reunited with his father at a banquet, they are both seated as guests of honor. And the results of meeting an ancient God gives Bernie quite the surprise. Wow ! This character driven book was well worth the wait. Bravo! Encore! Click here for a Complete List of awards won by The Universe Builders Series. This entry was posted in Book Awards & Honors, Book Reviews. Bookmark the permalink.